It was a few minutes after 4 P.M. on September 29, 2004, and the telephone rang in the office of Washington, D.C., Mayor Anthony Williams. It was Commissioner Bud Selig calling with a short but monumental message, “Congratulations. It’s been a long time coming.”1 Washington had a major-league baseball team for the first time since the end of the 1971 season. Four days later, the Montreal Expos franchise played their last game, losing to the Mets 8-1 at Shea Stadium in New York. The franchise was still owned by Major League Baseball, so Washington was also going to get new owners, a new name, and eventually a new ballpark. 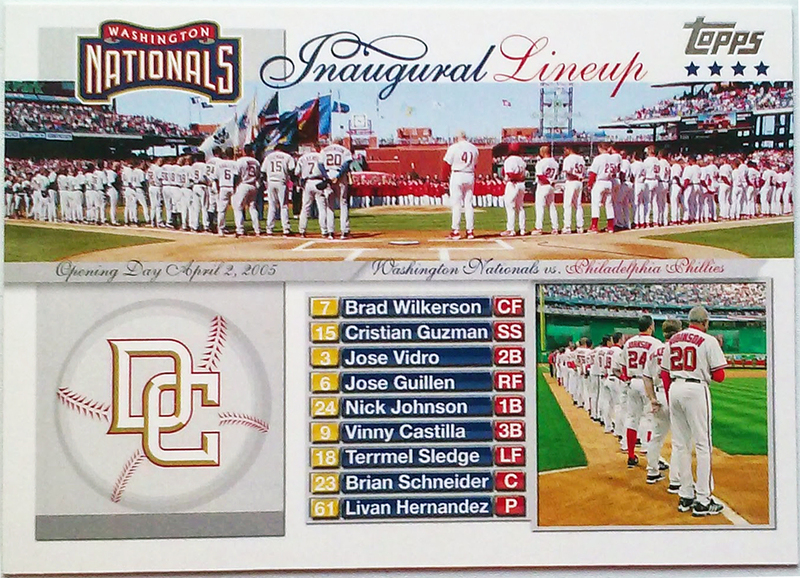 Opening Day for the 2005 season was six months away and one last hurdle remained to ensure that, indeed, baseball had returned to the District. A deal was needed between MLB and the D.C. Council to fund and build a ballpark along the Anacostia River. The weeks of debate regarding the issue of public funding were often heated and the negotiations between all the parties were often contentious. On December 21, 2004, by the narrowest of margins, 7 to 6, the D.C. Council approved a finance package acceptable to all parties.4 Baseball was back and would be played at RFK Stadium for the next three seasons while Nationals Park was being built to open for the 2008 season. Meanwhile RFK Stadium was being readied so the Nationals played their first nine games on the road, starting in Philadelphia. Vinny Castilla and Cristian Guzman had been signed in the offseason by Nationals general manager Jim Bowden and Jose Guillen was obtained in a trade with the Anaheim Angels.5 The remaining players in the lineup were returning from the 2004 Montreal Expos. The honor of starting the Nationals’ first game went to Livan Hernandez, who had been a Montreal Expo since 2003.6 Hernandez had been instrumental in the Florida Marlins’ postseason march to the 1997 World Series title. In the NLCS, he won two games against Atlanta and was named the most valuable player. In the World Series, he won two games to lead the Marlins over the Cleveland Indians in the seven-game series and added another most-valuable-player award. Naturally, this would be a game of many firsts for the Washington Nationals. Their first batter, Brad Wilkerson, singled off Phillies starter Jon Lieber to no consequence. In the second inning, consecutive singles by Nick Johnson and Vinny Castilla were followed by Terrmel Sledge’s RBI groundout for a short-lived 1-0 lead. The Phillies responded in their half of the second inning. With the bases loaded on two singles and a walk and no outs, Mike Lieberthal’s groundout to first scored Pat Burrell and Jon Lieber’s sacrifice fly scored Kenny Lofton. The Phillies extended their lead to 3-1 in the third inning when Bobby Abreu, who had singled to left field, scored on Burrell’s two-out double. The fifth inning proved to be the undoing of Livan Hernandez. Jimmy Rollins and Placido Polanco opened with singles and Jim Thome was intentionally walked to load the bases with one out. Burrell’s sacrifice fly and second RBI of the game scored Rollins. Hernandez’s first pitch to Kenny Lofton was his last pitch of the game. Lofton hit a three-run home run and the Phillies had a commanding 7-1 lead. Hernandez’s struggles were uncharacteristic. In 2004, he reached the sixth inning on 33 of 35 starts7 and he led National League pitchers in both starts and innings pitched (255). T.J. Tucker relieved Hernandez and yielded a single to David Bell, who was thrown out at second base trying to stretch it to a double. In the top of the sixth inning, Terrmel Sledge became the first Washington National to hit a home run. With Vinny Castilla scoring ahead of him after a single to left field, the Nationals now trailed 7-3 and the game was about to be turned over to the bullpen for the Phillies as well. In the top of the seventh inning, the Nationals solved Phillies reliever Rheal Cormier, who yielded two singles and a walk to load the bases with one out. Ryan Madson replaced Cormier with the tying run at bat. Madson walked in one run but got Sledge to hit into an inning-ending double play. The Phillies matched that run in their half of the seventh. They loaded the bases on two singles and a walk against Antonio Osuna, who then yielded a sacrifice fly to Chase Utley to close the game’s scoring at 8-4. Closer Billy Wagner set down the Nationals in order in the ninth inning for the Phillies victory. The Nationals and Livan Hernandez didn’t show any lingering effects from the Opening Day loss. Washington won the remaining two games of the series and completed its nine-game road trip with a respectable 5-4 record. Baseball’s return to Washington on April 14 at RFK Stadium awaited and Hernandez did not disappoint. He yielded only three hits to the Arizona Diamondbacks in 8⅓ innings but Chad Tracy’s three-run homer in the ninth inning brought in Chad Cordero for the save and a 5-3 win. Amid a 10-game winning streak, the Nationals took over first place in the National League East Division on June 5 and didn’t yield it until July 26. It is a place to which they would not return until the 2012 season except for a first-week stay in the 2008 season. Unfortunately for the Nationals, their 2005 fortunes faded in late season and they finished in last place in the NL East with an 81-81 record, nine games behind the division-winning Atlanta Braves. For serious baseball fans, there was no waiting for the Nationals to open at RFK Stadium in 10 days’ time. The author made his way by train to Philadelphia at the invitation of a friend, an avid Phillies fan. We settled into our seats in Section 108 amid the capacity crowd of 44,080 at Citizens Bank Park, one year after the new ballpark opened. It was time for some baseball and the long season ahead. The author accessed Baseball-Reference.com for box scores/play-by-play information (baseball-reference.com/boxes/PHI/PHI200504040.shtml) and other data, as well as Retrosheet.org (retrosheet.org/boxesetc/2005/B04040PHI2005.htm). 1 Lori Montgomery and Thomas Heath, “Baseball’s Coming Back to Washington,” Washington Post, September 30, 2004: A01. 3 Phil Wood, email to author, September 18, 2017. 4 David Nakamura and Thomas Heath, “Amended Deal on Stadium Approved,” Washington Post, December 22, 2004: A01. 5 On November 19, 2004, the Anaheim Angels traded Jose Guillen to the Washington Nationals for Maicer Izturis and Juan Rivera. 6 In March 2003, Livan Hernandez was traded by the San Francisco Giants with Edwards Guzman and cash to the Montreal Expos for Jim Brower and a player to be named later (Matt Blank). In July 1999, Hernandez had been traded by the Marlins to the Giants for Nate Bump and Jason Grilli. 7 Barry Svrluga, “At Long Last, Nats Lose,” Washington Post, April 5, 2005: D01.